If you'd have to analyze a normal work day on your computer, how would it look like? What are the common applications that you open? Which website do you spend the most time on? It can be quite difficulty to calculate those numbers manually, and it is likely that you may be way off. That's where time tracking software like ManicTime can help. The program monitors all PC activities automatically, so that you know exactly what you have done on your PC at a specific time of the day. 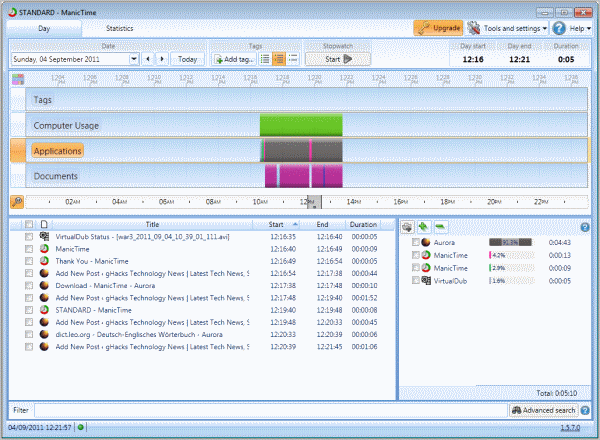 You can pause tracking at any time with a right-click on the program's system tray icon and the selection of "Go off the record". Installed in at work. I use this software to afterwards see how long I worked in the weekend. Always handy to see how long you did something. Keeping track of window titles is a distinctive feature. I usually pass on these applications but I’ll try this one. You know, some of our bosses read this site. ManicTime is a wonderful tool on Windows. Similar tools are RescueTime, Chrometa, Worksnaps which are all Saas based. That means the data will be loaded onto the server and the tool can be used for a team instead of just for personal use. They could be useful if you have a geographically dispersed team and want to collaborate and keep track of each team member’s time.